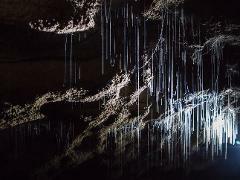 Underworld Rafting: Is a magical journey of discovery in the unmodified Metro Cave System, with the best Glow Worm display on earth, deep in the karst and unspoiled wilderness of the Paparoa National Park. A journey right into the heart of the West Coast rainforest, exploring the beautiful unmodified Metro Cave System, viewing an ancient "wonderland" of stalactites and stalagmites & gazing at its incredible glowing underground dwellers. Adventure Caving is a thrilling full-on expedition style caving trip where abseils, squeezes, waterfalls and amazing caverns need to be crossed ascending back to the surface. The Underworld Combo combines the best of the Underworld Rafting with Adventure Caving.